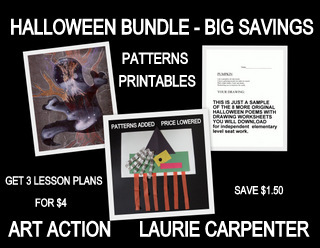 Halloween Lessons Bundled gives you three fun activities for the elementary art room, grade level classroom, or home school. The bundle includes 3 PDF lesson plans, photos, step-by-step directions, optional patterns, and language arts follow-ups, and saves the buyer $1.50 over the cost of buying the 3 lesson plans individually. Halloween is a holiday full of imagination, and these projects abound with creativity! WHAT IS BETTER THAN INDEPENDENT SEAT WORK? 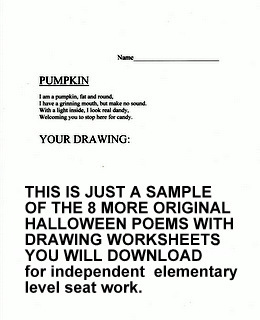 The Drawing Worksheets can be used during quiet time as printed seat work utilizing both drawing, reading, and writing skills, but also allowing imaginations to flourish. LET THE WITCHES FLY! 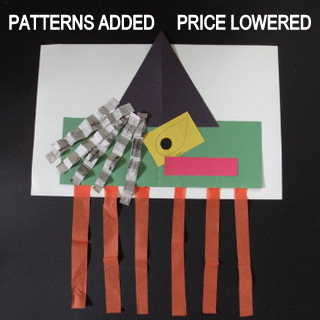 Contrasting with the worksheet experience, The Halloween Witch Windsock provides a simple cut and paste craftivity for the primary student, following a step-by-step procedure with teacher direction and optional patterns, that make this an "easy-art" project. Older students who wish to design with their own ideas have that option, as well. IT'S HALLOWEEN - LET'S EXPERIMENT! Is it art or science? 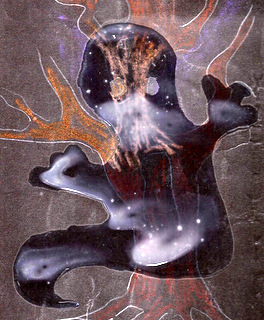 Creating a Halloween mood through unusual mixed media can be so much fun. Social interaction through oral presentations and language arts follow-up make this project suitable for ALL classrooms and home schooling.